!! !Newly refurbished outdoor patio for 2019!!! Just along Woolacombe’s Esplanade sits Cliff Cottage in its own private gardens, set back and elevated from the road. 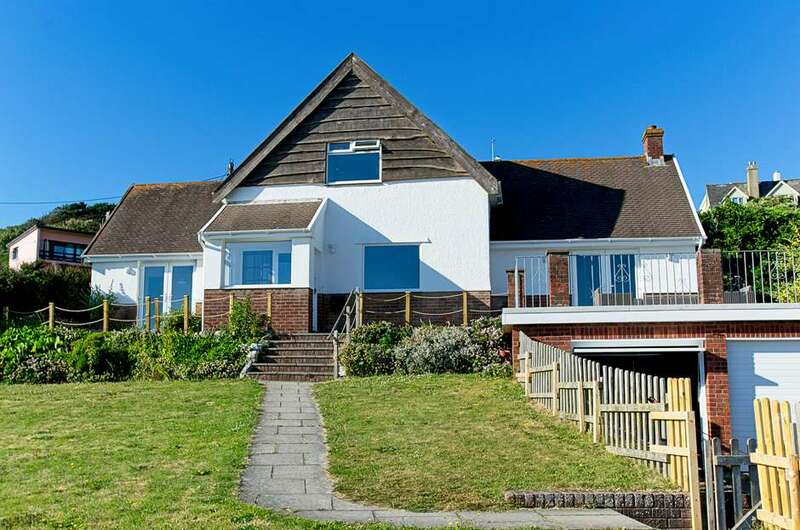 Literally steps from the beach, it commands outstanding sea views right across Woolacombe beach to Putsborough, Baggy Point and beyond. This 1950’s chalet-style house has been recently refurbished to a high specification and sleeps up to 8 in 3 spacious bedrooms and will accommodate 2 families very comfortably. The large front garden is enclosed with a low wooden fence and gate. There is plenty of car parking for 2/3 cars and the garage offers ample space to store surf boards, body boards, bikes and general beach kit. At the rear of the house are two heated showers to enjoy after a dip in the sea. Beach-life facilities at their very best! On the main front patio terrace there is a California-style outdoor furniture suite where guests can make the most of the amazing views. On the other front patio area, outside the kitchen diner, are a table and chairs for al fresco meals. To the rear of the property there is a decking area providing a more secluded outside space, yet still enjoying stunning views of the sea. As you step inside the house, to the left of the front door is the kitchen diner and separate utility room with washing machine and tumble dryer. The refurbished kitchen has white retro-style units offering plenty of storage, and new appliances including dishwasher, American style fridge/freezer and a range cooker with 2 ovens and 5 burners, including a wok burner. To the right of the stairs, the door leads to 2 lounge areas, separated by large double doors providing a flexible living space. The first room has two anthracite grey fabric sofas and a large 55” wall mounted Smart 4K Ultra HD TV. Through double doors is a larger lounge with original stone clad fireplace and patio doors leading to the seated terrace front patio. The property features a DEFRA approved Stovax 5kW energy efficient wood burning stove so you can cosy-up by the fireplace in the cooler evenings. There is a large L-shape corner sofa and additional footstool. Both rooms share the most incredible views over beach and sea…simply stunning!! At the back of the downstairs area is the newly fitted shower room with double shower, sink basin and WC. Travertine tiles finish a sleek contemporary look. Next to this is a double room with two single zip n’ link beds that can be made into a super-king (Please state your preference when booking). Upstairs are the additional two bedrooms. The luxurious master bedroom has a super-king size bed and enjoys amazing sea views. The other bedroom, ideal for children and teenagers, has a sturdy white wooden 3ft bunk bed and a white wooden single bed with an additional pull-out trundle bed underneath that can be conveniently positioned in an L-shape to maximise the floor space. At the top of the stairs there is also a bathroom with bath, sink basin and WC. The original grey tiles and suite have a 70’s feel and add to the charm of this delightful property. With new flooring throughout, white washed walls and beach influenced art-work, Cliff Cottage looks fresh, clean and modern yet retains the character of the older house that has always stood proudly on The Esplanade. Holiday Home Hunter are delighted to be able to offer Cliff Cottage for the first time ever to the holiday lettings market. This is proving to be a truly popular family holiday home. Book now to avoid disappointment! Dogs charged at £20 per dog per holiday. If you wish to bring more than 2 dogs please call 01271 870067 to discuss. A £200 security deposit is held and released after the holiday. No smoking or vaping in the house.